Having an on-screen drawing and annotation app can be quite handy especially if you wish to highlight or mark some important areas on your screen without having to edit it using a different photo editing app or image editor. This is exactly what Floating Draw is meant for but let’s find out if it can really live up to your expectations. 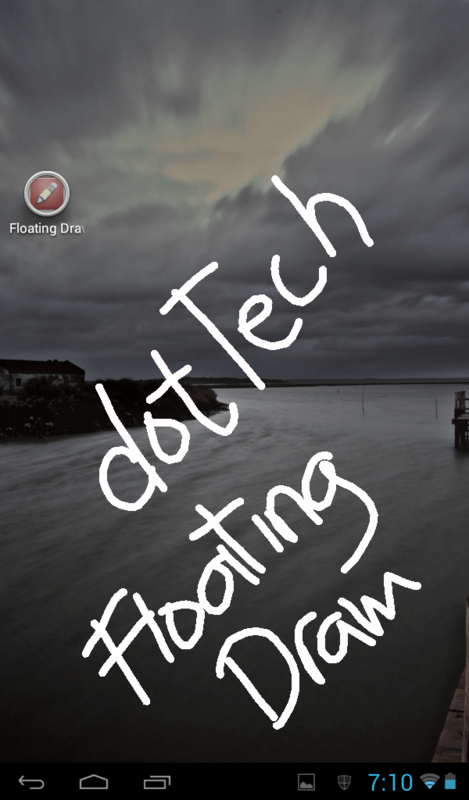 Floating Draw is a free on-screen drawing and annotation app for Android. With the help of this app, you’re free to draw anything on your Android screen. You can even write some notes or add some important markings. Compared to other drawing apps, this application doesn’t provide a separate drawing interface or canvas. Instead, it uses your Android screen as your canvas so you’re free to draw over your home screen, menu settings, app folders, etc. It doesn’t even matter if you draw over the interface of your active apps. Floating Draw lets you do all these and once you’re done, you can save your work by taking a screenshot. Features a full set of drawing and painting tools – this includes the tools for draw, erase, palette, shapes, fill, undo, redo, clear all, etc. There are times when you’re prompted to highlight or mark some important parts of your screen. Of course, you cannot simply do this without taking a screenshot of your screen first and then that’s time that you can draw or add some annotations to the screenshot. One good example of this is when you’re trying to highlight some sections on your home screen. Furthermore, not all Android devices have a built-in feature that is similar to that of Samsung’s S Note. So if you want to draw on the screen of your phone or tablet, you will need an on-screen drawing app like Floating Draw. 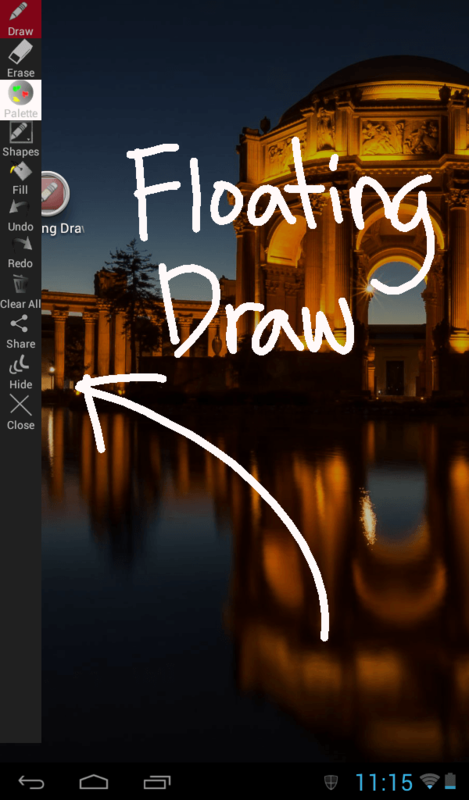 Floating Draw is very easy to use. Once you install it on your device, just launch it from your app list to open its floating toolbar. Just keep in mind that this app is a simple tool that you can use to draw or annotate on your screen. It may not feature a full suite of advanced drawing and sketch tools but it’s good enough to provide you with the most basic tools that you need for creating doodles, quick notes and memos. If you want to draw, just select the pencil tool and you’re free to draw wherever you like. It doesn’t even matter if you are in the middle of watching a video or browsing a website. You can also use the palette tool to change your pencil’s size and color. Another notable feature of this app is that it lets you undo or redo your actions. You can also fill the screen with any color that you like and you can immediately return your screen back to its normal interactivity state in just a single tap of a button. Functionality wise, Floating Draw does a very decent job. It does what it is intended to do plus it doesn’t have any annoying glitches or errors. It’s just that it lacks the ability to automatically save your work. This means that if you want to save the drawings or notes that you’ve created, you need to manually take a screenshot of your screen. After which, it’s up to you if you want to save or share your screenshots to other devices. It’s also a bit of a downer that this app doesn’t let you hide the toolbar while keeping your screen on its drawing mode. It would be nice if the app could add this feature in its upcoming versions. All in all, Floating Draw has proven that it can be useful at times when you need it the most. It’s a tad bit different from an ordinary drawing app but it’s definitely a great choice especially if you are the type who likes to make some impromptu notes, memos and even doodles. The only downside to this app is that it doesn’t have a built-in screenshot tool plus you cannot hide its toolbar while your screen is on drawing mode. Nevertheless, this app is definitely worth checking out.